Made as a series of virtual experiments, Quantum Fluctuations shows the complexity and transient nature of the most fundamental aspect of reality, the quantum world, which is impossible to observe directly. In the laboratory, elementary particles are observed by measuring the spoils of a proton collision and comparing the findings with data collected from supercomputer simulations. It is perhaps the most indirect method of observation imaginable, a non-representational form of observation mediated by computer simulations. In *Quantum Fluctuations*, particle simulations are used as the brush and paint to create abstract moving paintings that visualize the events that happen during a proton collision. In these virtual experiments millions of virtual particles interact to create stochastic structures and patterns that allude to quantum properties such as wave-particle duality, superposition, entanglement, and indeterminacy. The film begins with the underlying quantum fluctuations and interactions that occur in the background of a collision. It shows the intricate structure of the proton beams that collide to create an outflow of particle showers which create composite particles that eventually decay. These visualizations were created with input from scientists working on the Large Hadron Collider at the CERN, Geneva. By using computer simulations as an artistic tool, this conceptual reimagining of quantum theory aims to challenge our ideas of how scientific observation and knowledge are formed. 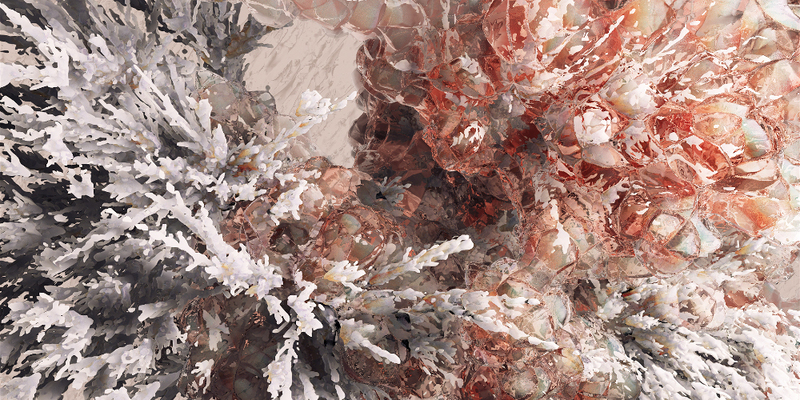 Markos Kay (CY/UK) is a digital artist, director, and lecturer with a focus in art and science. The aim of his work is to create public engagement with complex science. His art and design practice ranges from screen-based media to projection and print. Kay’s work can be described as a series of experiments using generative methods which explore and abstract the complex worlds of molecular biology and particle physics.